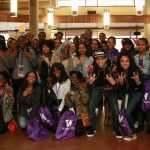 Our Winter programs were developed as a resource for first generation, low income, and underrepresented minority students who are planning on attending the University of Washington. YGB utilizes African American history and culture in such a way that motivates and empowers attendees to take control of their future. The purpose of this conference is to promote positive self-esteem, social consciousness, and cultural awareness, while simultaneously emphasizing the importance of higher education.